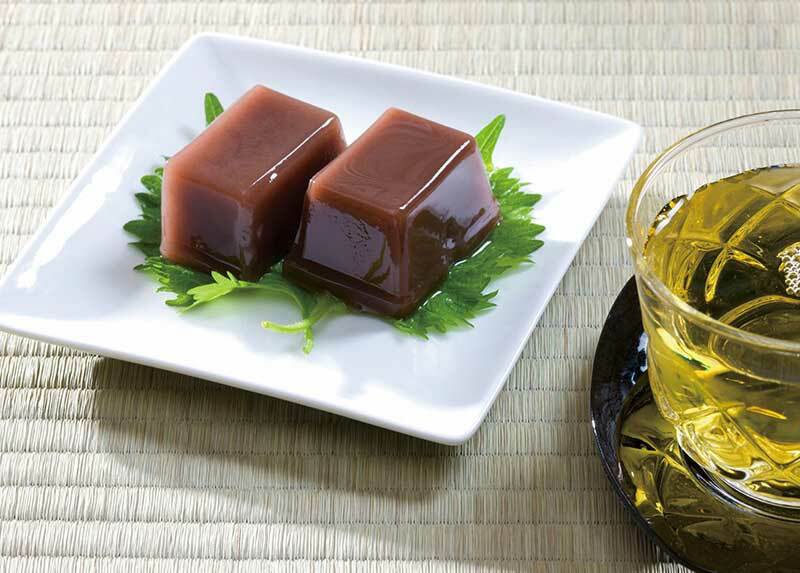 Yokan is the general term used to refer to this jelly dessert, which is made with just three ingredients—red bean paste, sugar and kanten powder. The latter is similar to agar-agar powder in Singapore and is extracted from red edible seaweed, making kanten powder an ideal alternative to animal or chemical-based gelatin. The red bean paste used can be either smooth (tsubuan) or coarse (koshian). Yokan is also sometimes made with a white bean paste instead. Mizu yokan, however, has a higher water content, which comes as no surprise because “mizu” means “water” in Japanese. Because it contains a lot of water, the texture is softer and smoother, making it a popular choice as it’s served chilled during the hotter months. The dessert is not very difficult to prepare. Once all the ingredients are cooked together, it has to be chilled in the fridge for a few hours. The mixture is moulded into a square or rectangular block, then cut into pieces when it’s ready to be served. Sometimes, other ingredients are added too, such as fruits or matcha powder. This not only makes the jelly delicious, it also adds various colours and designs to it, making it almost too pretty to eat. Since the original flavour is mild, it’s easy enough to add any other elements you prefer if you’d like to experiment.